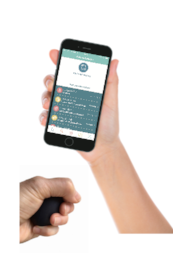 OliTool, a system comprised of a ‘holdable’ connected object, Oli, and a companion app, was developed by Ogenblik with psychologists and behaviour scientists. It draws on validated cognitive behavioural therapy and behaviour change practices and can help you tackle issues such as anxiety and worry, chronic pain and addictive behaviours. OliTool®️ has been developed by Ogenblik Ltd.